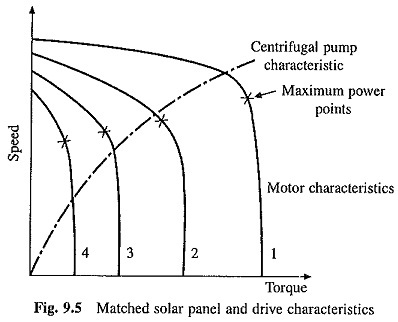 Solar Powered Pump Drives: Centrifugal and reciprocating. 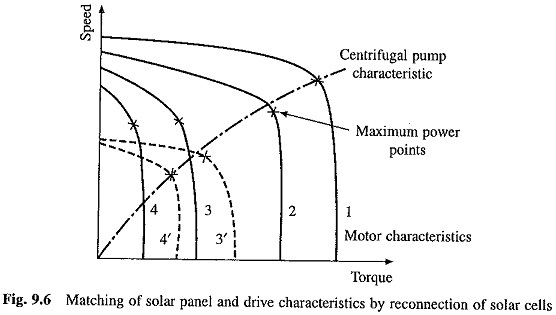 Their speed-torque characteristics are shown in Fig. 9.3. Centrifugal pump requires only a small torque to start whereas reciprocating pump owing to stiction may require as much as three times the rated torque. In centrifugal pump the output power is proportional to the cube of speed, and therefore, drastically reduces as the speed is reduced; for example, the output power reduces to half at a speed of 80%. In reciprocating pump, since with a reduction in speed the torque reduces only by a small amount, the percentage reduction in output is slightly more than the percentage reduction in speed. 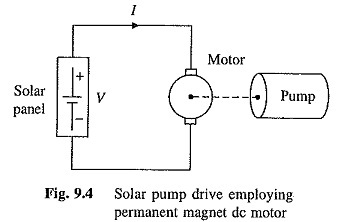 A simple scheme of Solar Powered Pump Drives using a permanent magnet dc motor is shown in Fig. 9.4. The solar panel directly feeds the motor. One can connect the solar cells to form a low-voltage-high-current or low-current-high-voltage unit. A low current-high-voltage arrangement is preferred because of lower proportion of losses in the motor and solar panel. However, a dc voltage more than 80 volts may present a serious electrocution hazard and should be avoided. Since the solar cells themselves regulate the maximum output current no starter is required for the dc motor. Noting that in a permanent magnet dc motor, the torque is proportional to armature current and back emf proportional to speed, the motor speed-torque characteristics for different insulation levels can be obtained from Fig. 9.2. These are shown in Fig. 9.5. For the optimum utilization of solar panel, the operation should take place at the maximum power points. This is not possible in the simple drive of Fig. 9.4. 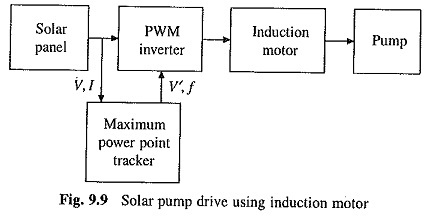 However, in case of centrifugal pump, the parameters of motor and pump can be matched so that the solar panel operates close to the maximum power points as shown in Fig. 9.5. Points corresponding to maximum power points of the solar panel are shown by ‘x’. Better utilization of solar panel is obtained by reconnecting solar cells, as explained with the help of Fig. 9.6. Characteristics 1 to 4 correspond to normal connection. The panel operates close to maximum power points with insolation levels corresponding to characteristics 1 and 2. By reconnecting the solar cells so that there are more units in parallel and less in series, the characteristics 3 and 4 can be modified to characteristics 3′ and 4′, which then provide operation closer to the maximum power points compared to the simple scheme of Fig. 9.4. For better matching a step-down chopper is inserted between the solar panel and the motor. With the help of the maximum-power point tracker, the duty ratio of the chopper is varied to obtain the solar panel operation at the maximum power-points for all insolation levels. The circuit for this is shown in Fig. 9.7. It should, however, be noted that the addition of one more power stage (i.e. chopper) increases the losses. Thus, although this scheme permits the extraction of the maximum power from the solar panel, because of the increase in losses, the power supplied to the pump may not increase significantly. Therefore, for a given application, calculation should be done for the losses and additional power output, so as to decide whether the chopper and maximum power point tracker should be employed or not. Use of the chopper and maximum ­power-point tracker offers an additional advantage. It ensures matching for all pump sites; although the pump parameters change with the change of site. 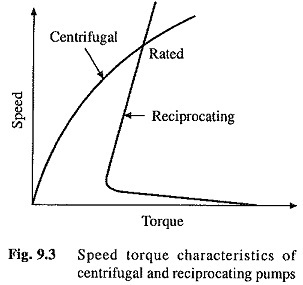 If a reciprocating pump is used, then the pump characteristic relative to the characteristic-I of the motor will be as shown in Fig. 9.8. The characteristics of motor and pump have been adjusted such that at the rated conditions of the motor and pump, maximum power is taken from the solar panel at normal insolation level. Such a drive will fail to start. One solution to this problem is to use two sets of solar panels, which are normally connected in series. For starting they are connected in parallel. This changes characteristic-1 to characteristic-1′ and the motor can now start because its torque exceeds stiction. This arrangement, however, does not allow operation near the maximum power points. Another alternative is to use a step-down chopper, which will allow the characteristic-1 to be modified to characteristic-1′ as shown in Fig. 9.8. Now the motor can start. The step-down chopper in conjunction with the maximum- power-point-tracker will also ensure that the maximum available power is extracted from the solar panel. Starting in this manner will make it necessary to operate the chopper at low duty ratio and high current. Thus, a semiconductor switch with high rms current rating will be required. This disadvantage can be eliminated by giving a push to the pump with the help of a rope and pulley arrangement to overcome stiction. The maximum power tracking control will however be necessary to ensure that the pump is also able to run at low insolation levels. The main objection to the dc motor drive is the presence of brushes which must be replaced after certain period, otherwise irreperable damage may be done to the motor. In view of this there is a need for improved brush material and construction such that the life of the brush will be long and after it wears, the motor will stop by itself. For pump ratings of 1 kW and above, three phase induction motor drive is employed. As shown in Fig. 9.9, a PWM voltage source inverter with maximum-power-point-tracker is used for variable frequency control of the squirrel-cage induction motor. 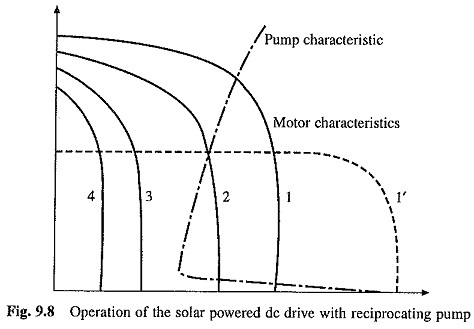 Solar Powered Pump Drives with an intermediate battery, as shown in Fig. 9.10, can also be used. The drive is fed from the battery charged by solar panel. It can be run without battery when some sunlight is available. With battery it can be run at a convenient time. In agriculture applications, it will generally run only for the part of a day, but the solar cells will be charging the battery for the whole day. Therefore, the solar panel rating can be substantially reduced, thus considerably reducing the cost of the drive. Battery drive can provide large torque. It is therefore suitable for reciprocating pumps necessary in some applications where high pressure is required, e.g. pumping water from deep wells etc. a charge controller is required to protect it from overcharge and excessive discharge. An alternative to battery for agriculture pumps will be to utilise the drive during idle period to pump water in an overhead tank and to use this water under low insolation levels.